If you're looking for sheet music for bass guitar, you have several options. Local bricks-and-mortar stores offer sheet music for sale as do many online sites. Free sheet music for bass guitar is also available. Whatever route you choose, you're certain to find a great selection to build your sheet music library. Free sheet music for any instrument can be tough to find due to copyright restrictions. Most of what's available consists of classical music and songs in the public domain. Here are a few sites that offer a nice variety of quality sheet music for bass guitar. Capotastomusic.com: If you're a beginner bass player or just want a well-rounded repertoire of traditional songs, try this site. It offers free, easy, bass guitar sheet music for popular songs such as America the Beautiful, Amazing Grace, Happy Birthday, and Auld Land Syne. The sheet music here has all been transcribed by the site owner. It also has a list of free bass tablature scores for common patterns. All music is in PDF format and may be downloaded and printed or saved to your computer. 8notes.com: 8notes.com offers free PDF sheet music for David Bruce's Funk Study 1-4. This is a great way to try funk style bass without spending money on lessons. The fifth installment of the series requires a paid membership which costs $20 per year, but the membership also includes downloads of all the other sheet music on the site. Free Scores.com: This site doesn't offer a large selection of bass guitar sheet music but there is a handful of songs available; most songs are classical. Enter "bass guitar" in the search bar at the top of the page to get a list of available songs. All music is in PDF format. IMSLP Petrucci Music Library: You'll find a huge selection of free, public domain sheet music here, but you must work a little to find what you're looking for. To start your search, enter "bass guitar sheet music" or enter a specific song on the home page search box. This will take you to a list of Google search results specific to the IMSLP domain. From there, sift through the results to find the songs that interest you. Much of the music is classical but you'll also find a selection of jazz, folk, and modern songs. Most scores are available to download as a PDF file. Online Sheet Music: Bob Marley, Rush, Steve Winwood, and The Beatles are just a handful of the artists whose songs are offered as sheet music for bass guitar on this site. Once you pay for a song, you can print it immediately or use the site's "Online Sheet Music Viewer" to transpose and print. Most songs cost about $5.00. Virtual Sheet Music: This site offers digital sheet music for download. Each song costs around $3.00, however you can become a member for just under $40.00 per year and receive a discount on downloads, access to an expanded music library, the ability to transpose song choices, and MP3 accompaniments to play along with. Sheet music in almost all genres is available such as rock, country, metal, pop, and funk. Music Notes: This site provides "look inside" copies of sample pages so you can try before you buy. Each download you purchase includes instantly printable, digital sheet music and an interactive, downloadable sheet music file. Easy and advanced bass selections are available in every genre from blues and rock to choral, jazz, and reggae. Each selection costs just over $5.00. 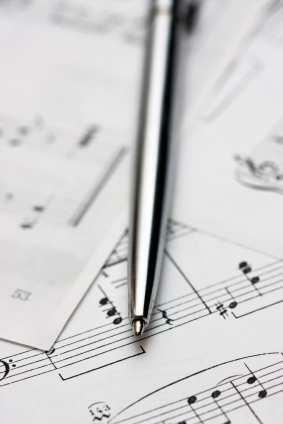 Sheet Music Plus: You can receive sheet music by mail or instant download through this site. Beginner, intermediate, and advanced selections are available, many with the option to listen before you buy. A variety of artists and songs are represented such as Iron Maiden's Fear of the Dark, Jimi Hendrix's Purple Haze, Deep Purple's Smoke on the Water, and Nowhere Man by The Beatles. Downloads start at about $4.00. If you're still having trouble finding what you're looking for (perhaps you are looking for a certain song or musical style), try these helpful tips to make your search easier. While your favorite bass tabs site might only provide tabs, be sure to look around before making that assumption. Many popular tab sites often provide sheet music copies of certain tracks. Your local library may have a collection of sheet music for you to borrow. If the library in your area doesn't offer sheet music, check with any local colleges that might have larger sheet music collections. Ebay sells a variety of bass guitar sheet music at any given time, especially songs that are no longer in print and difficult to find. If all else fails, try contacting a local musician's guild in your area. If these ensembles don't have sheet music for you, they will likely be able to steer you in the right direction. Unless you play by ear you'll need sheet music to play your favorite tunes. Thanks to digital technology, sheet music for bass guitar is easy to find, inexpensive, and easy to download. With such a huge variety of songs to choose from, you'll keep the music playing for a long time.